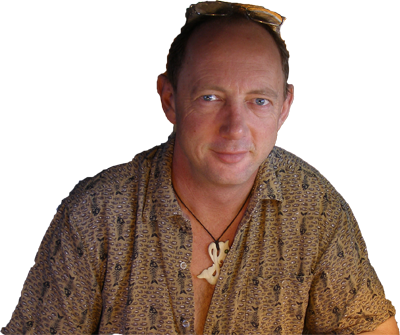 Ian Thorne is the owner/proprietor of The Bone Studio and Gallery (Est. 1996) and has been carving for 32 years ... since learning in Chris Bone's workshop in Wellington. 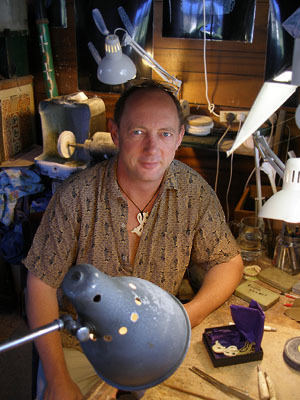 He has been teaching bone carving since running a course at the Owairaka Boy's Home in Auckland. Ian works in a broad range of materials including beefbone, whalebone and teeth, ebony, shell and horns. His styles also cross a broad range being influenced by Maori, Celtic, African and contempory design. All his work is of top quality finish and he specialises in carving to order especially with original designs. I was trained in the studio of Wellington/Motueka carver Chris Bone in 1988 where I learnt that if it wasn't perfect, it wasn't finished and that it wasn't "What can you carve?" but "What can't you carve?" The answer was "not much!" In particular, Chris taught me how to use gravers, high cobalt steel "chisels" that allow intricate detail and efficient carving without the use of rough drills which seriously limit the quality that can be achieved. One of my greatest pleasures in carving is being able to use a wide range of materials such as the variety found in whalebone (ribs, jawbone, shoulder and teeth), recycled ebony (statues), shells (mother-of-pearl and paua), teeth (pig tusks and seal teeth [found]), deer antlers and horns. The colours, textures and forms of these materials make every piece a challenge and a pleasure to create. After my first experience teaching bone carving two years later at a "boys home" in Auckland, I completed a tutor training course through the "Bay of Plenty Polytechnic" which helped make my classes more coherent. Since then, I have taught night classes, after school classes, conservation corps and marine studies, and I have taught over 1500 students (through the Coromandel Outdoor Language Centre) from Japan, Germany, Switzerland, Tahiti, France and Korea as well as backpackers and tourists from around the globe.